Ever since I heard this little segment on the radio a while back I’ve been very generous with tomato paste – pretty much putting it into every dish I can think of. It’s definitely got all those secret ingredient qualities. It builds up lots of super savory umami flavors (especially when browned a bit with onions), not to mention the lycopene levels are through the roof in this stuff. Making hash browns? Add a little tomato paste when you’re browning the potatoes. Cooking up some curry soup? Just a bit of tomato paste will result in your besting tasting version. Lentil soup? Spaghetti? Yup, yup! Better stock up! Pretty much the only thing tomato paste can’t do is making it stop raining down here. I think it’s been raining everyday for a week straight! One thing I found to help with this constant grey, chilly dampness besides wooly socks and hot tea is polenta. 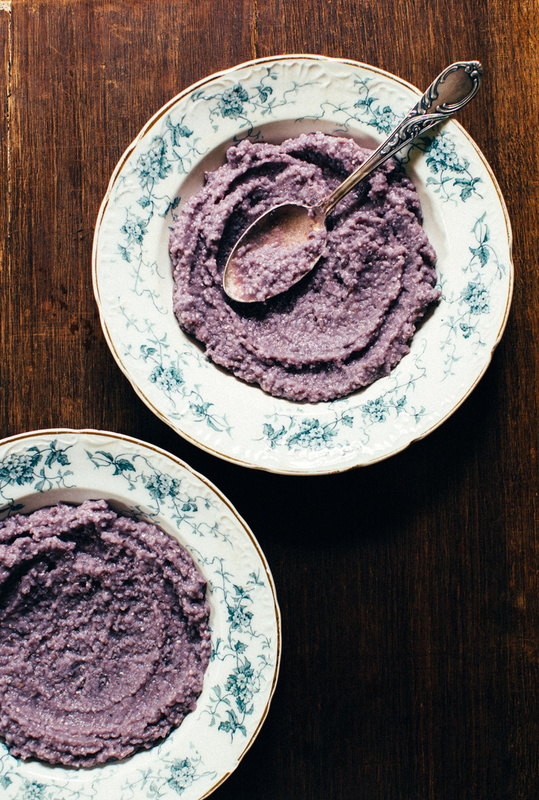 I just had blue cornmeal on hand so that’s what I used to cook up a creamy pot full of this (purple!) stuff. 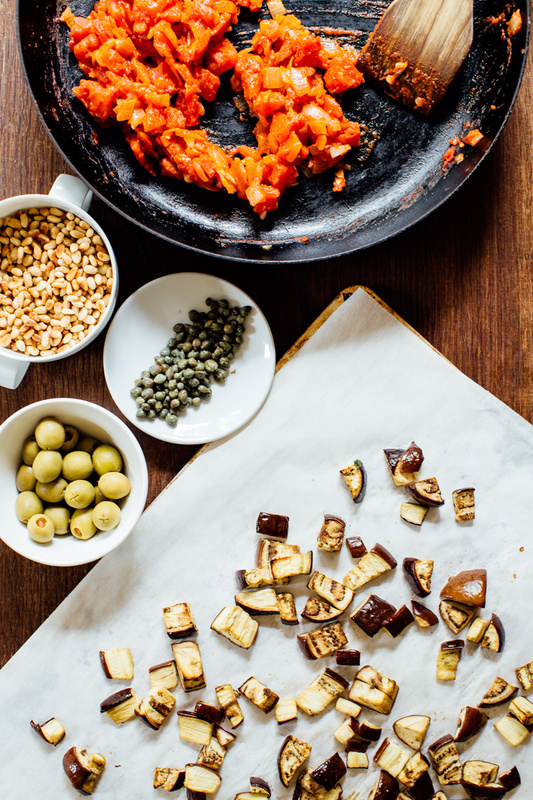 I thought it paired perfectly with this caponata – made with sweet and savory onions, roasted eggplant, olives and pine nuts. There was a little bit leftover which made a super tasty topping on a standard cheese pizza for dinner one night. And you know me, I also ended up tossing some with greens. Polenta to serve. 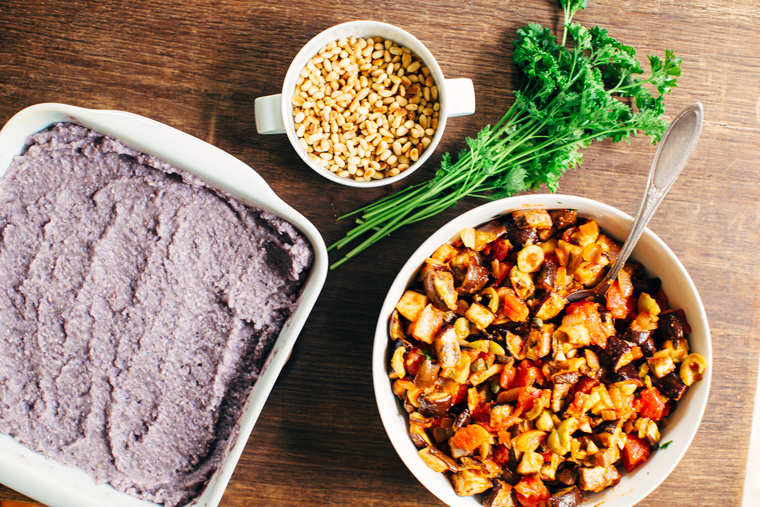 I followed this recipe and made it with whole grain, stone-ground blue cornmeal. Wash and cube the eggplant (pretty small cubes here). Toss with a bit of salt and olive oil to lightly coat. Roast on parchment papered baking sheet at 400F for 10 to 12 minutes or until lightly browned. While the eggplant roasts, finely chop the onion and sauté on medium heat with a bit of butter and/or olive oil. Add the sugar or honey and tomato paste. 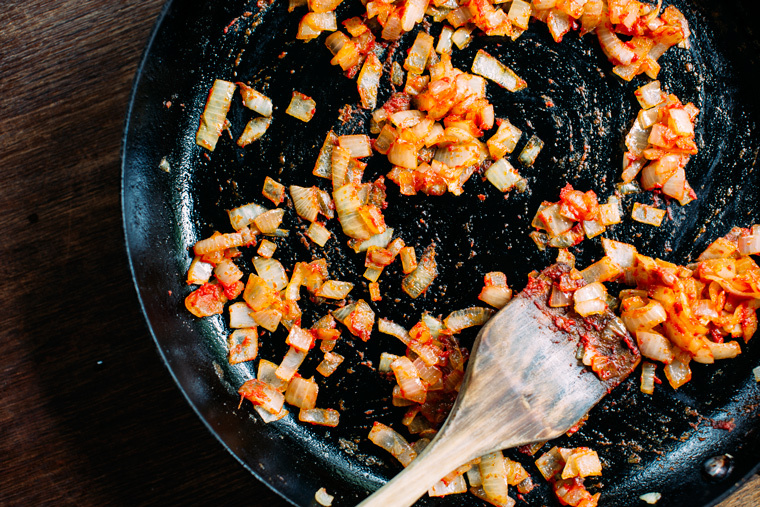 Sauté until fragrant and tomato paste turns from bright red to deep dark red, about 5 to 8 minutes. Add the the pressed garlic and then add the can of crushed tomatoes and vinegar, keep the heat around medium and chop up the olives and parsley. 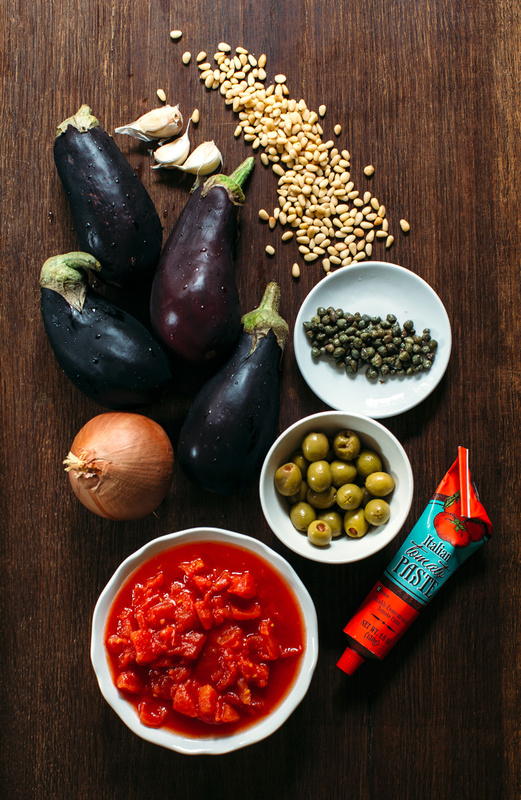 Once the tomatoes have started to thicken and the eggplant is finished roasting combine all the ingredients into a large serving bowl. Garnish with toasted pine nuts and and fresh parsley. 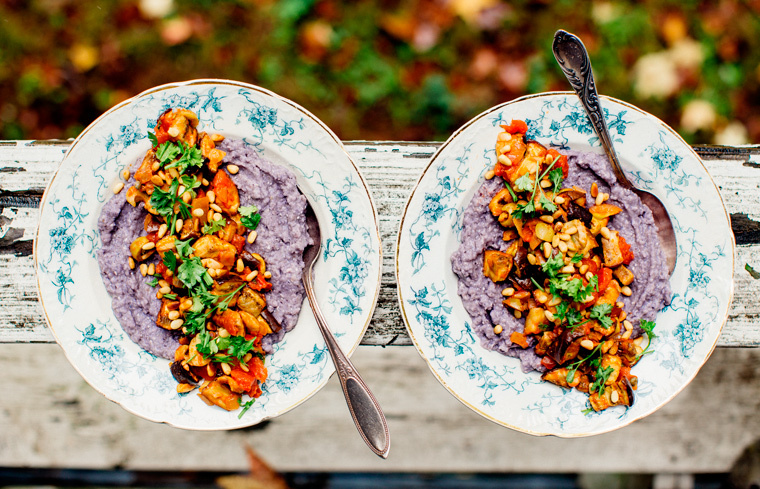 Serve with creamy cooked polenta. Eggplant caponata adapted from here. What a beautiful dish! I’m also a big fan of the richness tomato paste adds to dishes. 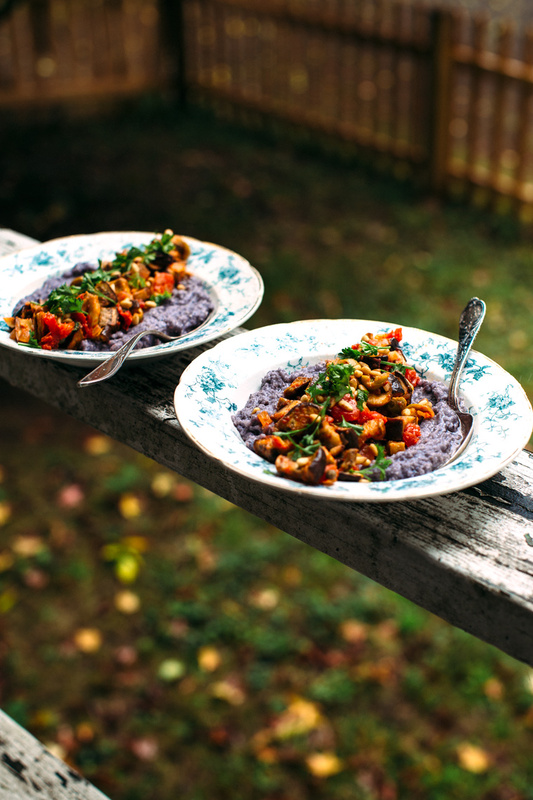 And this eggplant caponata looks to die for, seriously. I love the briny tang the olives and capers give it. 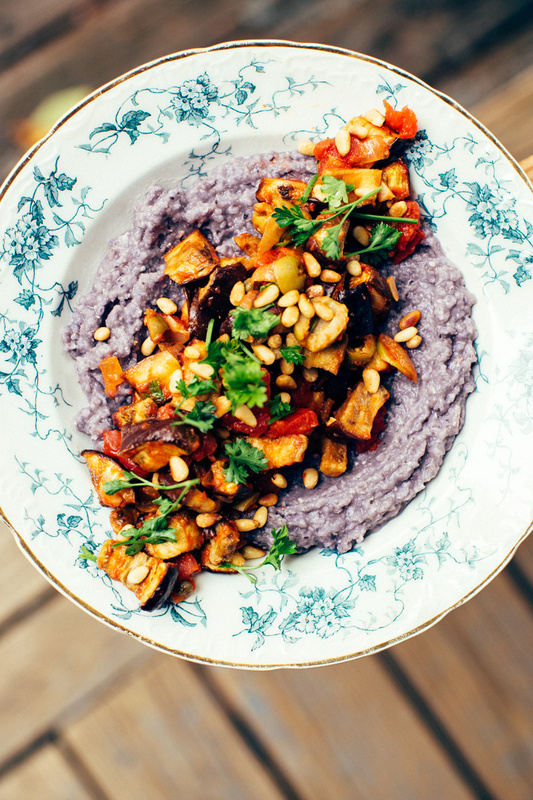 Really fun and colourful dish! 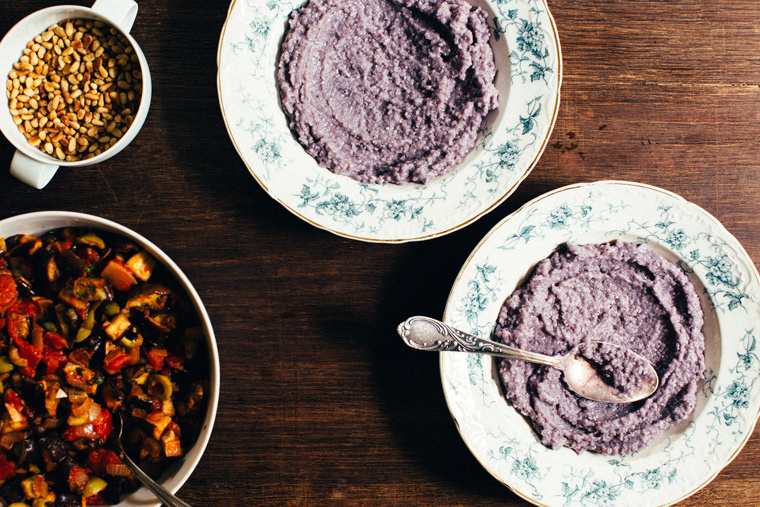 That purple polenta is lovely!! hello grace – such lovely photography and recipes you have. 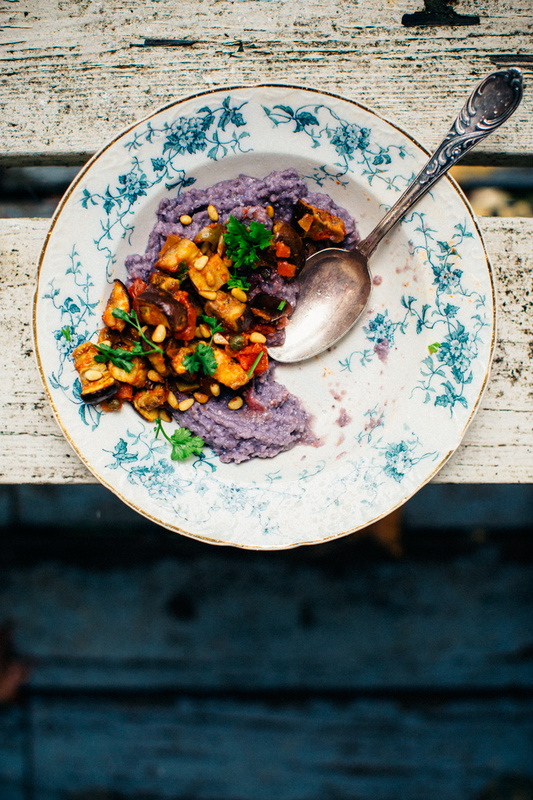 i am just recently discovering your blog, but your take on food is everything that i feel my own heart encompasses. i love tomato paste right there with you, as well – it’s a great addition. pleased to have found you, xo.